When cardiologist Dr. Paula Harvey, director of the cardiovascular research program at Women’s College Hospital, says that exercise is medicine, it’s not just a clever reminder that physical activity is good for you. Research has shown that exercise is a powerful therapy that can help reduce blood pressure, cholesterol and blood sugar levels, among other benefits. Exercise has clear benefits for cardiovascular health, but it also benefits mental health, bone and joint health, and probably cognitive health, Dr. Harvey says. Canadian physical activity guidelines recommend adults get 150 minutes of moderate-to-vigorous aerobic exercise per week. Those benefits start almost immediately, even if you can’t see them. In her physiology lab, Dr. Harvey looked at women’s blood pressure, heart rate and blood vessel health before and after a 45-minute walk at a moderate pace on a treadmill. “I can show that blood pressure and blood vessel health is significantly improved after 45 minutes of just walking at a moderate intensity where you could hold a conversation,” she says. Dr. Harvey stresses that exercise doesn’t have to mean competitive sports or extreme activities. It can mean finding something that you enjoy doing and perhaps can do with your partner or your kids or with friends at lunchtime. For some people, things like age or chronic conditions may seem like barriers to exercise, but it is never too late to benefit from physical activity. Conditions such as osteoarthritis can actually benefit from exercise. With the right supervision, almost no condition is a barrier to exercise. 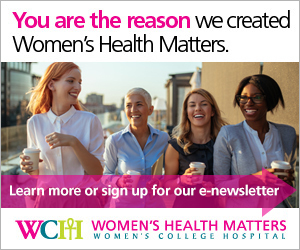 For example, women in the Women’s Cardiovascular Health Initiative – a cardiac rehabilitation program for women at Women’s College Hospital – do a supervised program until is it safe for them to continue exercising on their own. In addition to regular exercise, you can add physical activity into your day by looking for opportunities to walk a little farther, or to get out of your chair instead of using email. “So use the stairs, and get up and go and speak to your colleague. Just keep moving,” Dr. Harvey says. Even on days when it seems difficult, being more active pays off in health benefits. In fact, especially on days when it seems challenging, physical activity offers great value for the time invested: it brings more oxygen to your muscles and organs, it helps manage stress, and it promotes better sleep. Those benefits build over time, resulting in improved overall health. “If you’re looking for a tonic for everything, it’s exercise,” Dr. Harvey says.